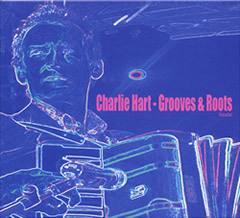 In 2008 the Austrian label, FRW released Charlie's first-ever solo album. The album features Charlie's writing and playing over the years, as well as performances by numerous musicians, listed below. Grooves and Roots starts with some recently recorded 'zydo-funk' tracks (a type of drum 'n bass) and progresses on to songs and instrumentals written in the seventies and eighties, notably OK Roland (written with Ian Dury) and the instrumental Software Breakdown (recorded by Juice on the Loose). The album finishes off with some infectious African grooves and Walter Wagenleithner's remix of 'Don't fix it', which also features Ulrike Kuehlwein (Mama Oliver) on vocals. FRW are a strong independent Austrian label, who also organize the Undisputed Peace Festivals across Europe. These festivals provide a platform for a wide spread of musical genres and bring together local and Austrian bands. The album was launched at the Reigen Club Vienna on March 1st 2008, during tenth Undisputed Peace Festival. As special guest Charlie enjoyed performing live on stage with Original Suntouchers and also performed Don't Fix it! live with the Loop Doctors and Mama Oliver (vocals). Grooves & Roots is described by Roland Schmitt as 'a really exciting cross-section of Charlie's work as musician and composer'.